BYO Booth What is Hashtag Printing? Hashtag printing allows guests at your event to instantly print and display their own photos by simply using your hashtag when they upload them to Instagram or Twitter. It adds a fun and interactive element to weddings and parties, encouraging people to share their photos to receive a physical print. For corporate events, hashtag printing also gives brands the perfect opportunity to expand their social media outreach by having more interaction with their hashtag. Hashtag printing only requires a computer, a printer and BYO Booth Hashtag Prinitng Software. The computer can be a PC laptop, all in one touchscreen, or Windows tablet. The printer should be a 4"x6" photo printer. If you are not a photo booth owner, you can use a USB Photo Printer. If you are a photo booth owner, you can use the same type of dye sub printer you use for your booth. There are also companies that make enclosures specifically for hashtag printing like this one. It's very easy to set up a hashtag printing station for your own wedding or event using the equipment and software listed above. But if you prefer to hire someone else for the job, there are thousands of photo booth professionals all around the world who offer hashtag printing. Just ask them if they use BYO Booth! 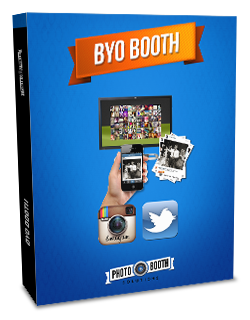 BYO Booth is the original hashtag printing software. BYO Booth continuously scans Instagram & Twitter for your hashtag. When someone posts a photo with your hashtag, BYO Booth will download it. Guests can print their branded photos and you can display the live feed in a slideshow. BYO Booth is what hashtag printing is all about!